So when I moved to Kansas, I have to admit, I was not all that thrilled with it. There are times I am not very thrilled with it now but that's for a different reason. Sigh. 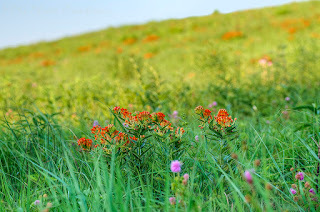 Anyway, then I went to Konza Prairie for the first time and found a place I just love. It's a Tall Grass Prairie Biological Station,mainly for research but they do a lot of public education as well, mainly for students but also for adults. I loved it so much I became a Docent and am also currently serving on the Board for Friends Of. 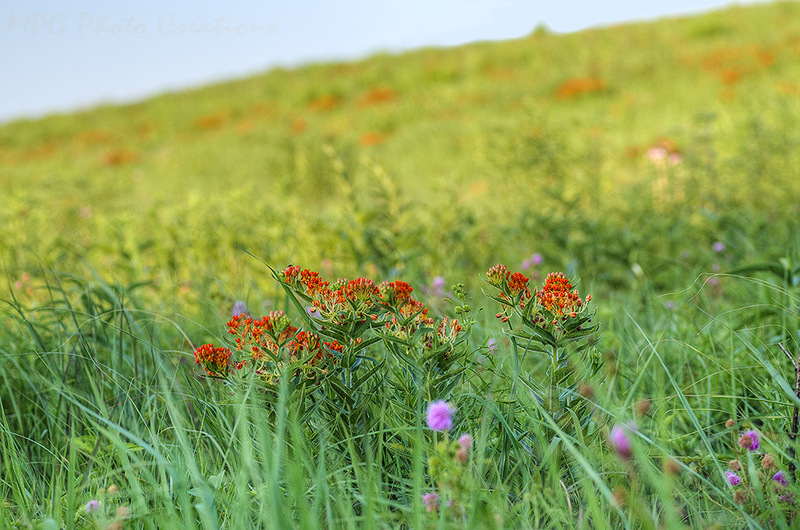 Last weekend was their annual Wildflower Walk and the Butterfly Milkweed was putting on quite the show. Butterfly Hill was just full of orange and reds all over. This is a shot looking up the hill with one of the darker, more red varieties in the foreground. The pink ball flowers are from Cat's Claw Sensitive Briar whose leaves, when you run your finger along them, will close up. Very fun to do.